It was the discovery of gold in the hills of California that brought the 49’ers to seek their fortunes. There is still gold to be found at the Ironstone Vineyards in Murphys, CA . The 44 lb. 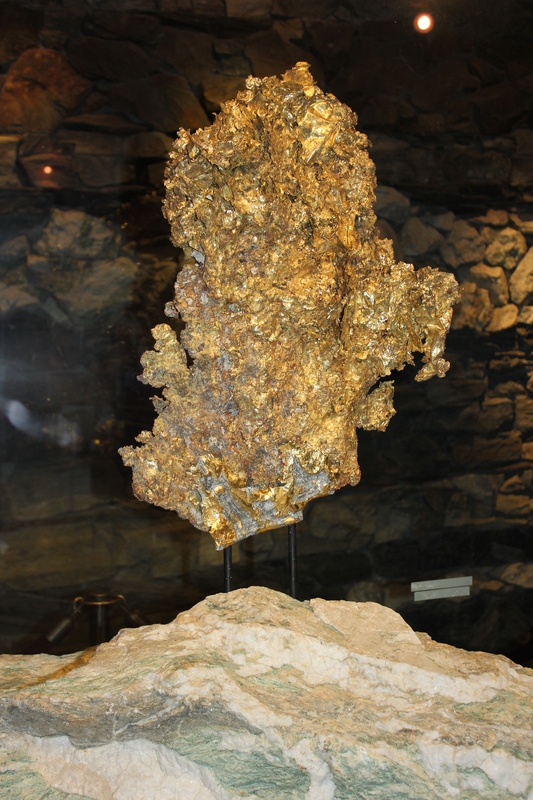 specimen of Crystalline Gold Leaf displayed at the Museum at Ironstone Vineyards in Murphys, CA is the world’s largest of its kind. That is one reason to visit the area in addition to tasting some great wines paired with great food and viewing the art at the 16th Spring Obsession Art Show and Sale. The Avocado, Tomato, and Marcarpone Stuffed Shells paired with the 2011 Obsession Symphony wine was my favorite pairing at the artists reception on March 2nd. It was also fun to spend the evening with fellow East Bay Area artist Robin Leimer. 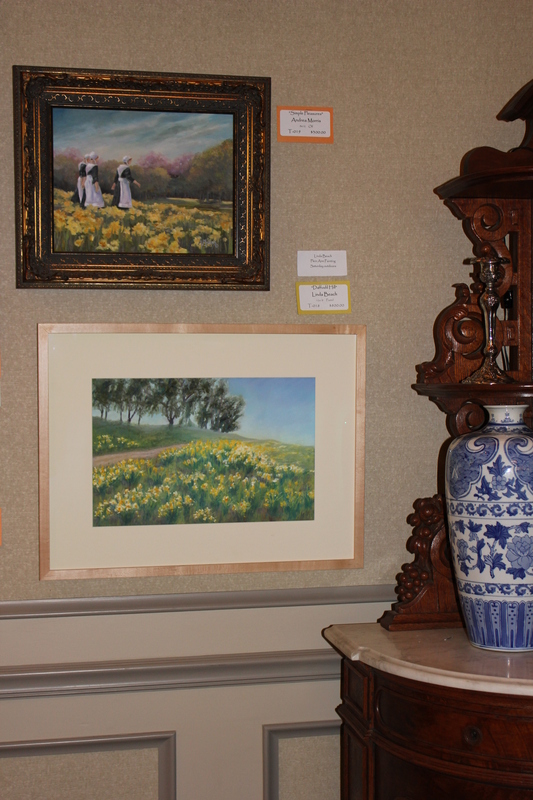 My painting “Daffodil Hill” was selected to be shown in the Theme Division and is on exhibit in the Alhambra Music Room through May 12th. While the vintners wait for the growth on the grape vines, the daffodils were beginning to show their own golden hues. I set up my easel by the miner’s shack where gold panning was offered. 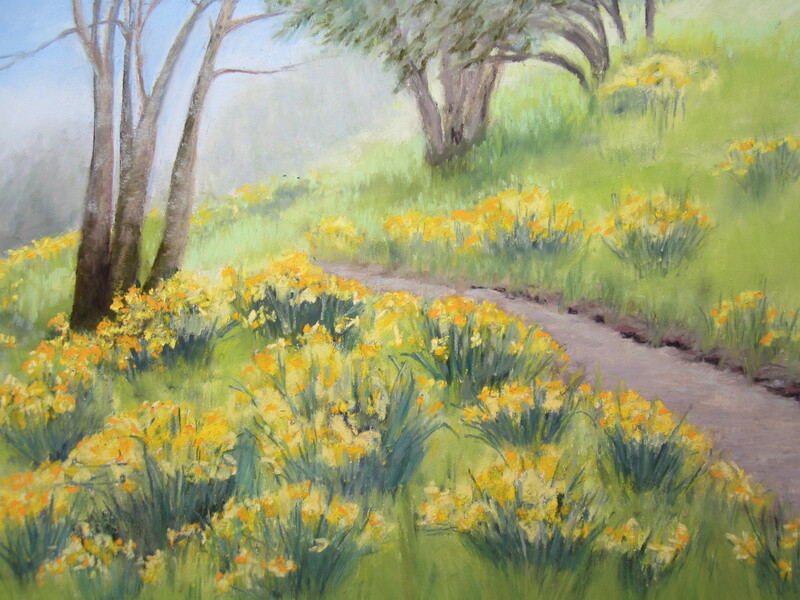 Instead of panning for flakes of gold, I shuffled through my assorted sticks of pale yellows, golden yellows, and bright orange yellows to suggest the colorful array of daffodils on the verdant hillside. It was great to have our friends the Nelsons stop by while I was painting before they went to the winery tasting room and the art show. Here is my interpretation of the scene. 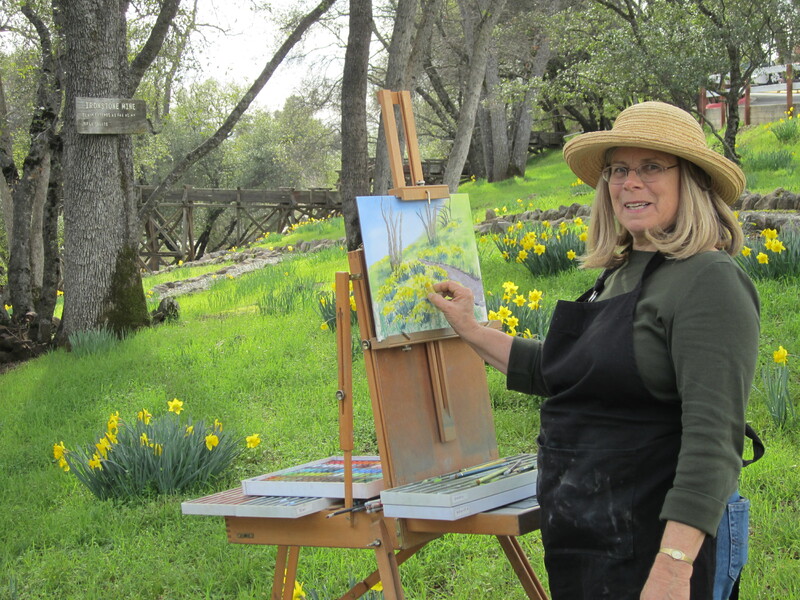 It was a beautiful spring day for painting at Ironstone Vineyards.